Just as the history of this model kit is a little strange, so too is the history of the real thing. Originally conceived from the T-72 as a ‘stop-gap’ MBT (while other models were tested including the well known ‘Black Eagle’) but eventually became the main new battle tank of the Russian Army, due largely to the fact that new projects were cancelled due to lack of funding. It also needs to be said that the development of these new MBT’s and the T-90 were during the late 1980s and early 1990s, a time of great upheaval and problems for the USSR and eventually Russia. The T-90 thus began life in a fairly muddled period for Russia. Improvement work on the T-72B had been going on for some time at the Uralvagonzavod plant in Nizhny Tagil. This resulted in the T-72BM. However, chief designer Vladimir Potkin knew that despite the efforts to modernize the BM it was still inferior to both the T-80 and various Western tanks. Upgrades were obviously needed to bring it up to par with these other tanks, especially the T-80- essentially the mission was to create a tank based on the T-72BM that was more equal in terms of performance and combat effectiveness to the T-80U. The automated fire control system from the T-80U and a similar but modified autoloader were installed into the prototype which became known as ‘Object 88’. Naturally the modified tank also included the very best in military advancements at the time including Kontakt-5 ERA, the 2A45 125mm Smoothbore gun and the latest in military communication technology. Operation Desert Storm then provided a great lesson to those working on Object 88. The use of SACLOS (Semi-Active Command to Line Of Sight) missiles like TOW and laser guided ATGM’s like Hellfires against Iraqi armor proved how vulnerable the T-72 could be to these types of weapons. In 1985 Kontakt-5 ERA had been introduced on the T-80U, and it went without saying that it would be mounted on Object 88. However, in 1988 a laser based defense system had been developed. This was to be known as Shtora-1 ECOMDAS (Electro-Optical Counter Measures Defensive Aids Suite). Essentially Shtora would trick SACLOS missiles into thinking the target was above or below where it really was causing the missile to spin upward or downward out of control while laser guided missiles would be defeated using Shtora’s smoke grenades which would confuse the incoming missile. By late 1992 Object 88 had been trialled and accepted for service as the T-72BU but the name was soon changed officially to T-90 with the T-90E being the export version. As was said earlier the main gun on the T-90 is a 125mm smoothbore which can also fire the 9K119 Reflex missile (AT-11 Sniper B), the co-axial being a 7.62mm PKT as well as a 12.7mm machine gun (T-90M can utilise a remote weapons station). Unlike the expensive and thirsty gas turbine of the T-80 the T-90 relies on a multi-fuel supercharged diesel engine with a top speed of 60km/h and at only 46.5 tons the T-90 follows its predecessors in being exceptionally light for what it carries. There are some variants of the T-90. The T-90A is the most common, and this differs from the original production model in that it has an all-welded turret instead of the original cast design. This version entered service with the Russian Army in 1999 and from 2001 all T-90s have been manufactured with this turret, including those built by and sold to India as the T-90S. The 90A is sometimes referred to as Vladimir in honor of the original designer, Vladimir Potkin, who died in 1999. The 90SK is the command version of the 90S. The T-90S is known as the Bhishma in Indian service. The original production T-90 with the cast turret was marketed as the T-90E and the command variant was known as the T-90K. Like most vehicles in active service the T-90A has been through several upgrade programs since 1999. These have included modifications to the autoloader, optical devices and a new engine, the IN-92S2, whereas those previously where powered by the IN-84MS. These modifications were completed around 2004 and since then the 90A has also received a computerized tactical information suite. The latest modifications have resulted in a new designation, the T-90M (sometimes known as T-90MS or T-90M (S), which has not yet entered service. This may be due to the fact that some of the systems included have not yet been fully tested. They include a new auto-loader, improved main gun, a remote 12.7mm MG, a B-99 engine and most importantly a new ERA system called ‘Relik’ (sometimes called ‘Relikt’). Little is known about this new armor but it is said to be much more effective than Kontakt-5 but it is not yet present on any tank in Russian service. In 2010 other modifications were also announced, designated T-90AM - the modifications were announced to the public in September 2011 and included many of the M upgrades but also included an automatic transmission for the engine, an upgrade to the combat information suite and an auxiliary power unit. Again, this variant is not yet in service. At the end of 2010 some sources claimed Russia had up to 460 T-90’s in service and from one source I consulted there may be as much as 250 more now (January 2012) in service. It is likely the T-90M or AM will be brought into service in some form in 2012. Despite Russia being involved in several conflicts since 1992 the T-90 has not seen a lot of combat service. There is a debate about whether any served in either of the two Chechen wars, and this debate is likely to continue. It must be said that none of the Russian sources I consulted mentioned anything about service in Chechnya. However, these sources did mention that some units may have seen action in Dagestan in 1999 and that T-90s were present in some places during the 2008 Russo-Georgian conflict. Export orders have been fairly good for the T-90, the biggest user being India with over 600 in service. Algeria was expected to field around 290 by the end of 2011 (pending manufacture and delivery). Cyprus, long time users of the T-80, were said to have ordered 41 in 2008 but there have been questions of funding since then and I can see no information about deliveries as of 2012. Libya was said to be interested in buying the T-90S but these negotiations were never completed, nor were negotiations with Lebanon or Morocco. Syria was also said to have been interested in purchasing the T-90 in 2009 but due to recent trouble there completion of this deal seems fairly unlikely. In 2009 Turkmenistan bought ten T-90S’ and in mid-2011 Thailand ordered 200. Feeling more stable I delved further into the box, pulling out five large sprues cast in grey plastic plus, another surprise, glazed parts. There are also some decals, two pieces of net and some silver string plus the instructions. The difference between this kit and anything Zvezda have done in this area before is apparent from the first look at the sprues. The moulding is simply light years ahead of what has gone before. Detail is crisp down to the smallest parts, there is virtually no flash anywhere and the sprue attachment points are well thought out and very thin. Tracks are of link and length variety and as a very neat touch some areas come pre-shaped along with separate guide horns in strips. Detail is not skimped at all in doing this and it sure makes for a far less daunting build than loads of individual links and guide horns you would have to cut and clean. The sprue’s are also quite big and could have easily been split in half making double the number but I find the larger sprue’s to be quite good- there isn’t a huge pile of them to wade through when you are looking for some tiny part. In fact the moulding is so good some have suggested (here on Armorama) that maybe Zvezda contracted another company to do the mouldings. I personally don’t think this is the case. In the past 6-12 months Zvezda has released some extremely well received kits- these include HMS Dreadnought and a line of 1/72 Mi-24’s- all got excellent reviews and looked to be of very high quality. Some of Zvezda’s new figure kits have also been getting a lot of interest. I believe this kit is Zvezda’s way of showing what they can now achieve and this is a very promising prospect. This contains many of the larger kit parts including the bottom and top of the hull as well as the side kits, fender and bottom glacis plate armor detail. You can clearly see the T-72 lineage in the hull size and shape but this is not simply a re-hashed older moulding, it is all new and all the better for it. Detail on the underside of the hull is good but to me appears a little soft compared to the detail on the fender on the same sprue which is undeniably sharp. Another one filled with larger parts including another fender, the hull sides with running gear attachment points, the un-ditching log, glacis plate, two part barrel and the top and bottom of the turret. The turret is easily my favourite part of the entire kit- angular, busy and simply cool! The detail on the sprue (without adding anything) is superb and finely cast- it even includes excellent wiring lines. The gun barrel is, unfortunately, a two part plastic affair, perfectly acceptable but a one piece moulding would have been better. No doubt the aftermarket will provide us with a metal one soon enough. The hull sides are excellent parts with great detail around the suspension arm attachment areas; although with the side skirts on much of this will be hidden. The un-ditching log is okay but the wood grain is very fine and looks a little too small to me but with some light paint coverage the grain should still come out. Unlike many tank kits the turret in this kit is not simply two halves- it is more of a ‘sandwich’ and the parts in the middle are on this sprue. They build up nicely around the lower piece of the turret and then the top of the turret goes on top. Some of the track parts with their separate guide horns also come on this sprue and they really are very nicely moulded with decent tread pattern. The guide horns are in shaped moulds matching that of the tracks and they simply attach in strips down the middle of the tracks. You get two of these sprues and they contain some long and short pieces of track and the running gear. The two-part wheels are nicely moulded with some fine detail on the bolts. Sprockets and return rollers are also well moulded and sport more excellent bolt detail. Much of the detail on the turret and some of the smaller details elsewhere are included on this sprue which includes well over 140 parts, all superbly cast- even tiny thin parts- and with small attachment points making it very easy to snip off even the smallest pieces. Highlights of this sprue are the multi-part hatch doors with great interior detail that includes the Commander’s Optical Unit and the Gunner’s Sight- both lovingly detailed- a really good reason to leave the hatch doors open! The only disappointing bit here is the gun mantlet- the fabric covering it is depicted in the plastic and it is somewhat soft. My favourite part of the whole kit is on Sprue F and these are the Shtora device housing- these frames are essentially boxes but with a strange knobbly, bumpy outer layer- very intricate in real life and moulded with absolute perfection by Zvezda. These are the clear parts and they include various periscopes, sighting/sensor device screens, headlights and the Shtora sighting lenses- all the light parts have the correct surface detail- these are very fine and high quality glazing pieces. Probably the weakest point of the kit these look to be generic Zvezda items that simply include numbers and Guards insignia. The numbers are perfectly acceptable but the Guards insignia could be better- I had literally just placed Guards insignia on a Trumpeter kit and there is a noticeable difference in quality between the two. This is not a major problem however, I find Zvezda decals may look a bit ‘off’ but they are usually pretty good once placed on the model. You get a silver piece of string for the tow cable and some mesh for the rear engine screens. These items are perfectly usable but some braided metal cable and a small PE sheet would have been a nice inclusion. The instructions are very well laid out and consist essentially 35 stages over 11 pages. There are two ‘columns’ on each page. On the left of each page are all the sub-assemblies for the parts detailed on the right. So for instance in Stage 1 we have a box showing the main pieces of construction and then parts highlighted in grey also going on with arrows calling them 1a and 1b- these are the sub-assemblies that the column on the left has you complete. That description may sound more complicated than it actually is but I assure you it is a simple approach and it works very well. There are only two schemes detailed on the last page of the instructions and they are a green color Guards tank and a tri-tonal tank that is the same colors as the box art. The colors referenced are all Testors Model Master and instead of being referenced to a chart in the instructions they are actually on the side of the box, which is a little strange. Up to now I have completed the first page- parts have gone together without any problems and the fit has been pretty much perfect every time. The quality of this kit and the fit of the parts is a real credit to Zvezda. They have you start on the turret which makes a bit of a change as AFV models usually go straight to the running gear. There is a good lot of glazing to do on the turret so be sure to remember the areas where it is present so you can mask it off prior to painting. There are options to have some sighting and sensor systems closed or open. You can also easily position the turret hatches open- the instructions don’t show you the option but just study how they attach to the turret rings and it is easy to work out, the connection areas are also quite solid so you don’t have to worry about accidentally knocking the hatches off, although do still take care! The only problem I have encountered so far is a simple miss-alignment on the smoke discharger mouldings- this creates a small seam line all around the mould but a quick once over with a scalpel and/or a sanding stick and it is good to go. I only mention this because I encountered a similar mould problem with the head in a relatively new Zvezda figure kit. Easily the most encouraging thing about the build (thus far) has been the effortless fit of the parts and the instruction breakdown is, for what is a very busy turret, well thought out. This is very encouraging stuff. In terms of accuracy I think this kit is excellent. However, it is likely that every nut, bolt and angle will be gone over in time and that will tell us more. In any case it looks like a T-90 and that is, after all, what really matters. The aftermarket is also likely to be looking at areas of the kit that have room for improvement. I’m sure we’ve all read reviews of Zvezda AFV kits in the past and the same things are usually mentioned- poor mouldings, rough plastic, the odd broken part and a general lack of detail and finesse. They were not bad kits and with some care and attention they could usually be built up into something decent. I want to emphasize this aspect of Zvezda kits in the past because opening the T-90 box dispels every one of these conceptions. Prior to this kit being announced there were always two questions surrounding it- when would it be released? And; Is Zvezda up to the challenge? To me it seems like Zvezda has answered this second question with some panache- the ease of building and the level of detail along with the quality of the parts really do make a statement and for those of us who have waited for this kit this couldn’t be a better answer. This is the first T-90 kit in plastic and for that alone Zvezda deserves a lot of credit. Add to that the fact the kit is a stunner and very reasonably priced and we have an undeniably great release- congratulations Zvezda! Highs: It’s a T-90 in plastic! A game changing kit for Zvezda- superb presentation, kit detail and build quality. Lows: Two part barrel not the best and some etch for the engine screens would have been nice, maybe a color painting guide too. Verdict: There is a lot to like about this kit and not just the subject matter. Quality for a great price and a well engineered and thought out model. You're very welcome David, I'm very glad my build was of some inspiration to you- many thanks . I (and I'm sure everyone else around here) would love to see some pics of your build. Newbie to the forums here. I have clarifications about the scale of the Zvesda T-90. I've already built a Trumpeter T-90 Cast Turret. Decided to build another T-90 and spotted would you believe the Academy/Zvesda T-90A. The box was branded by ACADEMY with a small logo for ZVESDA. Have read several reviews of this, the only difference I found with the real ZVESDA and ACADEMY/ZVESDA T-90 was that the ACADEMY has a photo etched fret for the engine grills. Which was nice. I bought it and built it. Compared it with the TRUMPETER T-90.It seems the ZVESDA hull is a bit longer and bulkier than the TRUMPETER. Would like to ask for any opinion on what brand has the right dimensions/scale for the T-90. Thanks. Hello Fer- I didn't know Academy were doing re-boxings of the T-90, that is interesting. Zvezda were actually supposed to release an etch set, metal barrel and rubber side skirts for their T-90 kit but apart from some pre-production shots a good while ago I have never seen any more news of it- so its also interesting that you get some etch in the Academy kit. As for the dimensions of the Zvezda kit- there are a good few threads on Armorama that tackled the dimensional problems. The biggest problem people here seemed to find was the running gear height. Obviously there were other problems here and there and you have touched upon that in your post. Unfortunately I don't have any of the threads bookmarked but if you use the search function on Armorama I am sure you will come across some of them. In terms of what company has the right dimensions I can tell you it is definitely not Zvezda- though don't get me wrong- their kit is both good and well priced but it does have its flaws. In terms of the 'best' kit I can't offer any direct experience because up to now I have only built the Zvezda one but from what I have read in reviews and build logs both the Trumpeter and Meng kits are excellent and I certainly haven't heard as many complaints regarding their kits as I have about the Zvezda one. Thanks Karl. I will try to post some pictures of the box of the Academy/Zvesda T-90. Am surprised that this is not available in stores in your area. Thanks again. Hi; The Academy/Zvesda partnership was announced almost A Year ago; Which was A WIN/WIN Coup for Zvesda, as it Helped them with Import into Western Markets. CHEERS; MIKE. Thanks for that Fer, very interesting to see. Mike- I get what you are saying- an agreement with Academy would certainly help Zvezda in various markets. 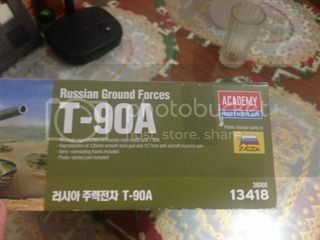 This ACADEMY/ZVEZDA T-90 is only available in one store here in Manila, and its only the T-90. Hope there would be other models, a BMPT Terminator perhaps.